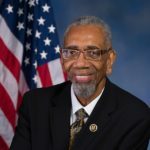 Bobby Rush is an American politician, civil rights leader and pastor. Rush is the U.S. Representative for Illinois’s 1st congressional district, serving in Congress for more than two decades; he was first elected in 1992 and took office in 1993. He has since won consecutive re-election. The district was located principally on the South Side of Chicago, with a population from 2003 to early 2013 that was 65% African-American, a higher proportion than any other congressional district in the nation. In 2011 the Illinois General Assembly redistricted this area following the 2010 census. While still minority-majority, since early 2013 it is 51.3% African American, 9.8% Latino and 2% Asian. It re-elected Rush in 2016. "Daley may not feel a moral responsibility to eliminate discrimination but he has a legal obligation to do so."